NEW YORK - The figure in the photograph is clad in Army fatigues, boots, and helmet, lying on his back in peaceful repose, folded hands holding a military cap. But he is not asleep; he is dead. And this is not just another fallen GI; it is Ernie Pyle, the most celebrated war correspondent of World War II. As far as can be determined, the photograph has never been published. Sixty-three years after Pyle was killed by the Japanese, it has surfaced - surprising historians and reminding the world of a humble correspondent who artfully and ardently told the story of a war from the foxholes. 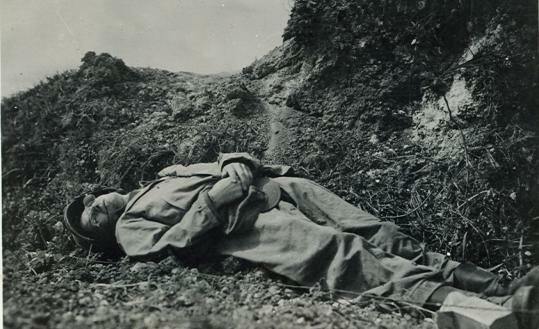 "It's a striking and painful image, but Ernie Pyle wanted people to see and understand the sacrifices that soldiers had to make, so it's fitting, in a way, that this photo of his own death . . . drives home the reality and the finality of that sacrifice," said James E. Tobin, a professor at Miami University of Ohio. Tobin, author of a 1997 biography, "Ernie Pyle's War," and Owen V. Johnson, an Indiana University professor who collects Pyle-related correspondence, said they had never seen the photo. The negative is long lost, and only a few prints are known to exist. Retired naval officer Richard Strasser, 88, of Goshen, Ind., who obtained a copy while serving in the Okinawa campaign, recently provided it to the Associated Press. From 1941 until his death, Pyle riveted the nation with personal, straight-from-the-heart tales about hometown soldiers in history's greatest conflict. His columns for Scripps-Howard Newspapers earned a Pulitzer Prize in 1944, and Hollywood made a movie, "Ernie Pyle's Story of G.I. Joe," starring Burgess Meredith as the slender, balding 44-year-old reporter. Pyle was killed before it was released. In April 1945, the one-time Indiana farm boy had just arrived in the Pacific after four years of covering combat in North Africa, Italy, and France. The Army's 77th Infantry Division landed on Ie Shima, a small island off Okinawa, to capture an airfield. On April 18, a jeep carrying Pyle and three officers came under machine gun fire. All scrambled for cover, but when Pyle raised his head, a .30-caliber bullet caught him in the left temple, killing him instantly. Army photographer Alexander Roberts was at a command post when he learned what happened. Roberts went to the scene, and despite continuing enemy fire, crept forward to record it with his Speed Graphic camera. His risky act earned him a Bronze Star medal for valor.